On the eve of the financial crisis, Jacob S. Hacker wrote "the policy book of the year" (E.J. Dionne, Jr., Washington Post), demonstrating and explaining the hidden story of growing economic insecurity. 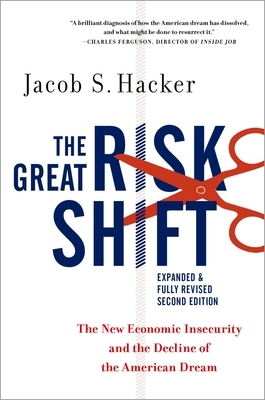 In this fully revised and updated second edition, he brings his powerful expos of "The Great Risk Shift" up to date with startling new evidence and compelling new ideas. Hacker shows that the safety net was unraveling long before the late-2000s, as more and more economic risk shifted from the broad shoulders of government and business onto the fragile backs of American families. Whether the problem is risky jobs brought on by corporate restructuring and the "gig economy" of contingent work, risky families created by the rising costs and instabilities of parenthood, risky retirement caused by the collapse of traditional guaranteed pensions, or risky health care fueled by skyrocketing costs and unstable coverage-Hacker shows what has changed and why, the ways in which ordinary Americans have been affected, and how we can fight back. Behind the risk shift, he contends, is the "Personal Responsibility Crusade" eagerly embraced by corporate leaders and conservative politicians who speak of an economic nirvana in which Americans are free to choose. But the result, Hacker reveals, has been very different: a harsh new world of economic insecurity in which far too many Americans are allowed to fall behind. Blending powerful human stories, big-picture analysis, and compelling ideas for reform, this remarkable volume has become a rallying point in the struggle for economic security in an increasingly uncertain world. Jacob S. Hacker is the Stanley B. Resor Professor of Political Science at Yale University and a frequent commentator on American politics and social policy. He is also the coauthor, with Paul Pierson, of Winner-Take-All Politics (Simon & Schuster), American Amnesia (Simon & Schuster) and Off Center: The Republican Revolution and the Erosion of American Democracy (Yale University Press).